The Rycote INV-4 InVision Microphone Suspension addresses the demand for a professional, Rycote-quality shockmount in the studio, conference settings and speech capturing applications. The entire mount is comprised of two large InVision lyres with two 9.5mm (0.37") mounting clips. The lyres rest on a bar with a 3/8" threaded stand adapter at the base. The InVision suspension system is available in various clip sizes to accommodate different microphones. The 9.5mm mounting clips included with this system are intended for mounting remote or small-diaphragm microphones at the connector, leaving enough space for windscreens at the microphone body. Some of the compatible microphones include the AKG C747, DPA 4000 Series, Schoeps CCM and CMC Models. The large lyre suspension webs measure 70mm high and 40mm wide to accommodate heavier microphones. 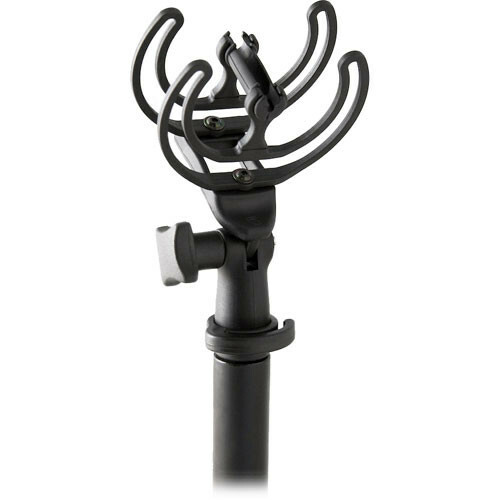 This is ideal for static stand mounting as well as boom placement. The lyre suspension webs feature 9.5mm clips for mounting remote or small-diaphragm microphones at the connector. Some of the compatible microphones include the AKG C747, DPA 4000 Series, Schoeps CCM and CMC Models. A reducing sleeve is included and intended for securing cables and microphone connectors smaller than 9.5mm. The unique lyre suspension is engineered with Hytrel for a virtually indestructible design that maximizes shock and noise suppression. A 3/8" threaded stand adapter is featured at the base for microphone stand mounting. Box Dimensions (LxWxH) 8.25 x 6.0 x 2.25"
Does somebody have first hand experience with how well this mount tackles handling noise when used with a Schoeps CMC641 with colette cable?